Published: Oct. 24, 2014 at 02:53 p.m. Updated: Oct. 24, 2014 at 06:15 p.m. The NFL changes in an instant, which is why it's important to stay abreast of how your players are looking prior to Sundays. Below is a look at whose stock is rising, and whose is falling, as we approach Week 8. Keep an eye on these players heading into Sunday to help make the right choices for your fantasy lineup, as their stock could be on the move again before kickoff. 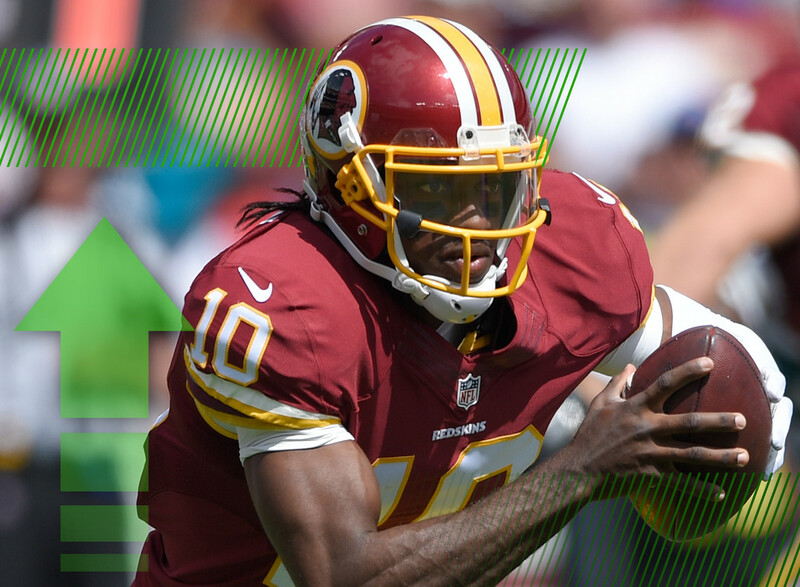 Weeks after dislocating his ankle, RGIII is on track to return to the starting lineup soon. Whether or not that will be on Monday night against the Dallas Cowboys remains to be seen. However, he's worth adding if he ended up on the waiver wire in any of your leagues, and he could be a good buy-low candidate in a trade. Remember when Jake Locker was a fantasy sleeper? Yeah, that blew up in all of our faces really quickly. A combination of constant injuries and inconsistent performances have likely spelled the end of Locker's time in Tennessee. It was announced this week that rookie Zach Mettenberger would be getting the start in Week 8. If for some reason Locker is still on your roster, cut him loose, but don't rush to add Mettenberger just yet. It appeared as if Watkins was having an up-and-down start to his rookie season, but that might have been more a product of his up-and-down quarterback. Once the steady but unspectacular Kyle Orton entered the starting lineup, Watkins' average yards per game jumped from 49.3 to 78.7 -- and that includes a game where he was marooned on Revis Island. The arrow is firmly pointing upward for the Clemson product. It's a shame, because I really like Alfred Morris, but his stock is falling in fantasy. He hasn't scored a touchdown in the last three games, and hasn't rushed for more than 90 yards since Week 1. What's worse, is that Morris gets subbed out when the Redskins need to pass the football, and given how often they're behind that is a frighteningly high number of plays. I recently traded "Bentley" away in one of my leagues, and it might be time for you to do the same before his stock sinks any lower. After three solid weeks on the field, Adams has securely locked up the third receiver role in the Packers offense. He's caught a touchdown twice in his last three games, and saw Aaron Rodgers look his way eight times in the other game. Adams' stock will continue to rise as his rapport with Rodgers grows, making him an enticing waiver-wire pickup. Bush is dealing with an ankle injury, and is listed as doubtful for Sunday's game in London against the Atlanta Falcons. Given the early start time of the game (9:30 am ET) it's probably best to just leave Bush on your bench rather than risk waking up to a zero if he doesn't play. With the departure of Percy Harvin, Baldwin has assumed the No. 1 wide receiver role for the Seahawks and did so with aplomb last week. He has a nice matchup this week against the Carolina secondary, a matchup he should be able to exploit for fantasy owners. Ryan hasn't been terrible in 2014, but he's been far from the top-tier fantasy quarterback we all anticipated. A large part of his struggles stem from an offensive line that has seen a number of starters miss time or worse, go down for the season. Ryan's matchup this weekend against the Lions and their dominant defensive line is not one to count on in fantasy. Over his last three games, Tannehill has averaged over 20 fantasy points per start, and aside from an abysmal first half against the Green Bay Packers, he's played quite well. Tannehill has been able to flash his athleticism and speed (he was a wide receiver at first in college) in the running game as well, further upping his stock and adding to his overall value. He's on the radar as a low-end QB1 from Week 8 on. Cutler represents the ultimate fantasy Jekyll and Hyde, as he's just as likely to throw for 300-plus yards and four touchdowns as he is to put up a stinker of a game like he did in Week 7 (7.90 fantasy points). He has a tough matchup this weekend against the Patriots before heading into his bye week. Until he proves otherwise, his stock is starting to drop. After missing his Week 5 matchup with a concussion, Bell has returned to action as the bell cow back for the Lions, racking up 164 total yards and two rushing touchdowns in his last two games. With Reggie Bush likely sidelined with an ankle injury, Bell will once again get the bulk of the touches against an Atlanta defense that has struggled to stop the run. He's a solid RB2 with RB1 upside this weekend. This Stacy situation is escalating, and not in a potentially awesome Stacy's mom kind of way. Stacy was thoroughly out snapped by both Tre Mason and Benny Cunningham last week, and while he was dealing with injuries, his future in this offense looks bleak at the moment. He made it into James Koh's "Panic Room" this week, and there's really no reason at all for him to be in your starting lineup this weekend. In his first significant NFL action, Mason saw 18 carries and took those for 85 yards and a touchdown. The rookie ran hard, and while he fumbled the football, his stock is on the rise if he continues to be the hot hand in St. Louis. It's hard to trust anyone in this backfield at the moment, but Mason is the name to own. Green is still dealing with his toe injury and is officially listed as doubtful for Sunday's game against the Ravens. Green has admitted that even once he returns to the field, he might not get back to 100 percent this season. Great, just what all of his fantasy owners were hoping to hear. Get well soon, A.J. -- a lot of fantasy seasons (and the Begnals' season) are riding on your health. Palmer has quietly turned in three effective fantasy performances in his three starts this season. He hasn't shown any lingering signs from his shoulder injury earlier in the year, and with the Cardinals offense humming along nicely Palmer is an intriguing option as a QB2 or spot-starter for upcoming byes (Aaron Rodgers, Matthew Stafford, Andrew Luck, Philip Rivers, etc.). This is a reminder that for now, Harvin's stock remains low. He was dealing with a thigh injury and then was shipped to a new team with a new playbook. Harvin is a talented playmaker, no doubt, but let's wait and see a) how he's used and b) how healthy he is after joining the Jets before we render any further judgment. Stewart ran hard last week in a blowout loss to the Packers, and he'll get the bulk of the work in the backfield for the Panthers once again with DeAngelo Williams and Fozzy Whittaker both likely to miss Sunday's game against the Seahawks. Stewart is a potential flex play this weekend, as the Panthers get the Seahawks in Carolina. Robinson was a hot waiver-wire pickup this week after rushing for over 100 yards and a score in Week 7, but Toby Gerhart is getting healthy and head coach Gus Bradley has said the team might "mix and match" in the backfield on Sunday. Robinson seems to hold the best long-term value, but for now his stock takes a hit as it sounds like he'll have to convince the coaches yet again to give him more opportunities in the offense. Queitly operating behind DeMarco Murray's monster season, Romo has been putting together a nice year as well. The veteran has thrown 12 touchdowns over the last five weeks against just three interceptions, and hasn't had less than 15 fantasy points since Week 2. Things looked dire early on, but Romo has reversed that trend and now is in the mix as a solid mid-tier QB1 for the rest of the season. Johnson's health is going to be a problem plaguing fantasy owners for a few more weeks. He's officially listed as questionable for Sunday's game against the Falcons, but again, that game kicks off at 9:30am ET, so if Megatron is on your team you'll need to be up early to watch his status. And even if he does play, there's a chance he's more of a decoy once again, as it doesn't sound like he has his full range of cutting/movement abilities back yet.